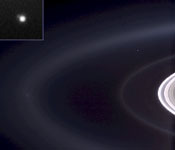 In figure 1, Earth is captured in a natural color portrait made possible by the passing of Saturn directly in front of the sun from Cassini's point of view. At the distance of Saturn's orbit, Earth is too narrowly separated from the sun for the spacecraft to safely point its cameras and other instruments toward its birthplace without protection from the sun's glare. A magnified view of this image taken through the clear filter (monochrome) shows the moon as a dim protrusion to the upper left of Earth. Seen from the outer solar system through Cassini's cameras, the entire expanse of direct human experience, so far, is nothing more than a few pixels across. Earth no longer holds the distinction of being our solar system's only "water world," as several other bodies suggest the possibility that they too harbor liquid water beneath their surfaces. The Saturnian moon, Enceladus, is among them, and is also captured on the left in this image (see inset), with its plume of water ice particles and swathed in the blue E ring which it creates. Delicate fingers of material extend from the active moon into the E ring. See PIA08321, for a more detailed view of these newly-revealed features. Images taken using red, green and blue spectral filters were combined to create this view. The image was taken by the Cassini spacecraft wide-angle camera on Sept. 15, 2006, at a distance of approximately 2.1 million kilometers (1.3 million miles) from Saturn and at a sun-Saturn-spacecraft angle of almost 179 degrees. Image scale is 129 kilometers (80 miles) per pixel.